This is another one of Smashbox's new releases, they've released a cream lipstick collection as well as a matte lipstick collection with huge colour ranges! Naturally I'm trying out a red because I seem to gravitate towards red for some reason, if you're going to wear lipstick you may as well make it stand out with a bold colour. I loved the application of these, they glide on super creamy - as the name would dictate. Although I would say that the colour payoff isn't great. This was a true red shade in the bullet but once applied on the lips it definitely lost some of its colour and applied far more pink than red. The product comes in a small tube containing pure magic. I'm obsessed with this product, I was a little skeptical about it as I just don't get how it would work in the first place but it does and I'm impressed! The tube carries 10ml and retails at £18, considering how many different combinations you can create - it's a pretty good price. 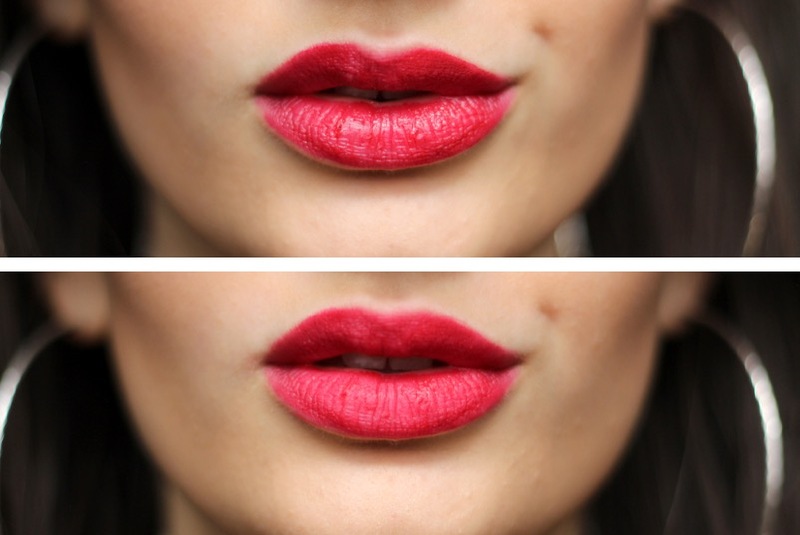 The tube puts it pretty simply: generously apply product onto the lips. I wouldn't say you need to be overly generous though, I would recommend one squeeze and then tap it onto the lips. It's definitely messy, I got a whole lot of lipstick all over my hands which removes some colour in the process but nothing too drastic which you can see below. Crazy right?! The finish following application reminds me a lot of the Avon Matte Lipsticks which I loved so needless to say I'm pretty obsessed with this little tube of magic. I've only tried this combo so far but loved it so much I simply couldn't wait to share! I already can't wait to try it more, time to rediscover some lipstick shades I love but never wear. If I really love it you may see it popping up in a favourites video soon! You can subscribe to my YouTube channel here. What do you think of Smashbox's insta-matte? Oh wow, this seems like such a genius idea! Definitely want to try this out on my favourite non-matte shades. Every time I see this on Instagram I feel like it would be perfect for me I'm all about matte lipstick, such a unique little product.